A century from Steven Davies and three key wickets from Stuart Meaker was enough to earn Surrey a place in the Royal London One-Day Cup final despite a late fightback led by the indomitable Tim Bresnan, whose late-career transformation into a Jacques Kallis tribute act is a welcome consolation for home fans. 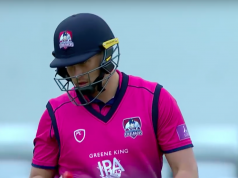 Alex Lees won the toss and fielded, then the early wicket of Dom Sibley to a very dubious lbw call from umpire Peter Hartley brought Kumar Sangakkara to the middle. The Sri Lankan star looked imperious when square driving his second ball for four, but unfortunately for Surrey the emperor he most resembled after that was Galba, who ruled Rome for just three months in 69 AD: a loose drive was easily held by Azeem Rafiq at cover to leave the visitors 8-2. No-one could begrudge Sangakkara a single one of his 594 international caps, but on today’s evidence it seems unfair that Steven Davies has only thirteen to his name. He kept the Southerners in the running during the powerplay with impeccable placement and shot selection, while being ably supported in the running by Rory Burns. Davies and Foakes rebuilt for Surrey in a confident and comfortable manner that called into question Alex Lees’s decision to bowl first. When Davies lofted Azeem Rafiq effortlessly for six to bring his total to 87 in the 33rd over and Foakes flicked Brooks for two to reach his 50 in the next, Surrey became narrowly the happier side. Davies reached his well-deserved century off his 112th delivery, but threw it away in a deeply frustrating manner. Matthew Waite bowled a slow full toss which Davies deposited in the grateful hands of Will Rhodes on the boundary rope. It was something of an atonement for Waite, who had dropped a caught and bowled chance when Davies was on 43. Sam Curran provided some entertainment in a brief cameo that included two good ramp shots and one fatal bad one. Foakes recorded his highest-ever List A score but fell short of his maiden hundred, tamely scooping Bresnan to Jack Brooks. Surrey posted a respectable 255-7 in the end – far more than they could have hoped for from 8-2, but all of the dismissals were soft and quite a few players made decent starts. Yorkshire lost Adam Lyth early on, checking a drive off Dernbach, and after some reconstruction work Alex Lees was bowled by Gareth Batty. Jonny Bairstow started to show signs of the quality that has made him a mainstay of England’s Test side over the last 18 months, but he too perished too cheaply to a checked drive, this time off Meaker. Gary Ballance was content to play an anchoring role, but it was part of a high-risk game plan that failed to pay off. Stuart Meaker produced some extra bounce to catch Ballance’s bat which had been obligingly held out. Meaker’s pace undid Jack Leaning a few balls later to give him figures of 3-4. The fightback from Tim Bresnan and Matthew Waite showed admirable patience and temperament, but they never threatened the Surrey total. The required rate rose slowly but surely and after it passed seven, the pressure told on Waite as he chipped Sam Curran to Gareth Batty. Yorkshire refused to bow out quietly, but the rate became ever more demanding and their batting resources looked ever thinner. Robbie Williams’ “Rock DJ” washed over a disappointing (4,836 is on the low side for such a big game), and disappointed, Yorkshire crowd, whose imaginative chant of “Yorkshire, Yorkshire” struck an ever more mournful note as the game eluded the home side’s grip. The crowd started to believe once more when Bresnan thumped Meaker over long on and the equation for Yorkshire returned to the realms of possibility. Ultimately, though, Tim Bresnan’s gutsy innings was futile and he holed out in the penultimate over to leave a clear season objective for Yorkshire: secure their third consecutive County Championship.